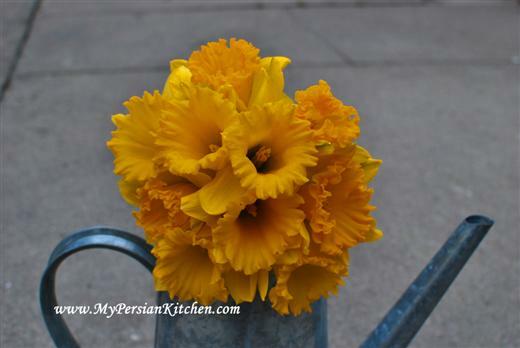 It’s March first today and for those of us who live outside of Iran means one thing: Norouz, Iranian New Year, is right around the corner and we must prepare for the new year! In Iran the anticipation of the new year is felt in every sense of the way. After months of cold the snow starts melting, days get a little warmer and sunnier, and flowers and tress begin blooming. Sadly I don’t get to experience this marvelous transition from the dark winter to the the brightness of spring in Southern California. For me, as silly as it sounds, I know spring is in the air when Daffodils start appearing at Trader Joe’s! Much to my excitement this year there is some flowers blooming in my yard. I went a bit crazy and planted a whole bunch of bulbs a few months ago. The picture above is of the very first Fresia that bloomed. It smells divine! It feels like spring is right around the corner! During the weeks that lead up to Norouz it is customary for Iranians to first and foremost do some Khaneh Takani, spring cleaning. Indeed, women will busy themselves cleaning every nook and cranny of their home. Additionally, during the weeks prior to Norouz there is some serious baking that takes place in order to make sure that each person has plenty of sweets to place on the Sofreh Hafseen, the traditional spread that is prepared for the New Year, as well as enough to share with family and friends. 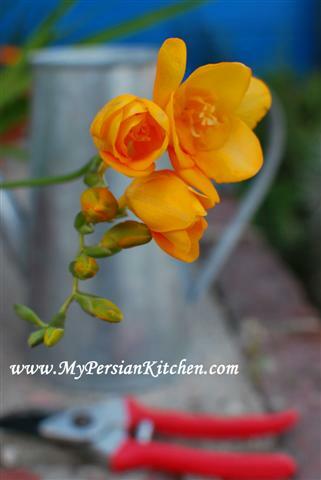 The next three weeks are going to be filled with lots of informative posts on My Persian Kitchen. I am going to post about the food that is consumed for Norouz as well as how to prepare the various elements of Sofreh Hafseen. So stay tuned, it’s going to be super fun and busy around here!!! I am so happy to have found this blog!! Nine months ago our Belgian-Iranian family (Irani hubby, Belgian me, daughter of 4 and boy of 3 went to live in Iran for an unknown period of time. Totally soaked into the tradition, culture, food and so on from Iran, living zir zamin of my family-in-law…difficult, interesting, a lot of duality, growing as a human being and endlessly things more. I am in some way from soul connected with this country, not only because i married my beloved husband. Some weeks ago i started so search on internet some information about how to make Persian food and i found you guys! Today i was searching information about Now Ruz en Haft Sin. I will wait everyday to read your posts, so that i can follow them in action! Thanks a million for all that you wrote already, it is a great help for me. Dear Eve, thank you for your sweet words! It must have been an amazing experience for you to live in Iran. I am glad you found this blog! I hope you will make many of the dishes and share with us your experiences! I am sorry my English is not that good, seems i wrote in some way that we dont live in Iran anymore. But we still do!!! We came here nine months ago and we will live here until we decide to go to Belgium again. But I have a gut feeling that we will be here for the rest of our lives! A week ago i made your polo reshte and my Iranian family liked it, and it was not just ta’aruf! So thanks again. I need your help surely with everything that has to do with now ruz, it is my first one!